With the shift in trends – all things going digital, it was only a matter of time before digital content evolved into a thriving industry by itself. Come 2017, we are now looking at massive upward trends marking the digital content industry. We now see more bloggers, more digital content writers and creators, more visuals and graphics – and all backed by strong analytics. More than 178 million blogs on the Internet are feeding information on various subjects, industries and matters every year. The figure is only bound to increase with Internet penetration worldwide. Blogging is also, slowly but steadily, taking the main stage with the developing habits of online shopping among over 3 billion internet users worldwide. Content is now a thriving business, and this business is rapidly evolving. Bloggers are now more focused on creating quality content, on actively promoting their content, and on regularly measuring results. The team’s findings show that bloggers can be broken down into two major groups – the Average Blogger who spends between 1 and 3 hours writing between 500 and 1000 words, and who occasionally looks into analytics; and the Average Blogger with “Strong Results”, who spends between 2 and 3 hours writing about 500 to 1500 words, posts/publishes several times per week, and is always up-to-date on his/her analytics. The trends were further broken down into five key areas for better understanding. 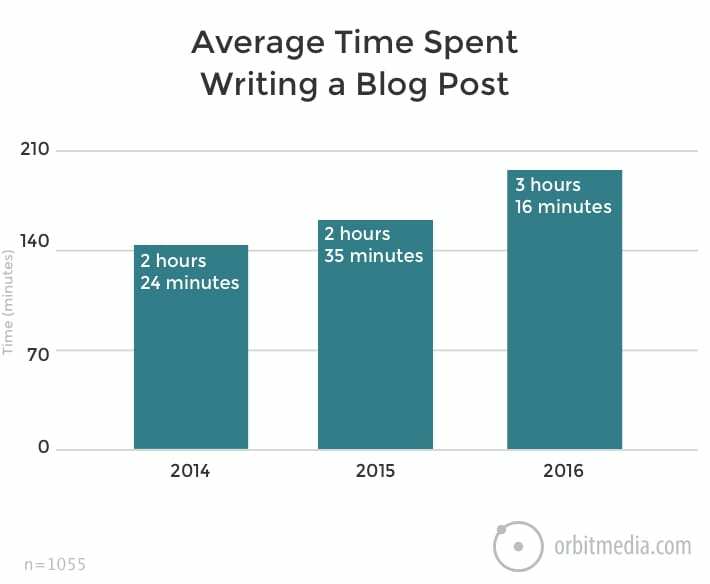 When asked “How long does it take to write a blog post?“, On average, bloggers responded that it takes them about 3 hours and 16 minutes to write. Additionally, the number of bloggers who spend over 6 hours on blog posts has doubled over the course of one year. Conversely, the number of bloggers spending less than 2 hours on a typical post has come down by one-third. Interestingly, bloggers who spent more time on their blog posts reported better results in comparison to those who spent much lesser time on theirs. The trends also show that bloggers are getting more serious about what they do, with at least 1 in every four bloggers claiming that they used a formal process for editing or the help of editors. Not surprisingly, those who used formal editing reported more results when compared to those who didn’t. The length of typical blog posts has gone up from about 887 words in 2015, to about 1054 words in 2016. That’s an increase of about 19% in the average length of blog posts. There has also been a noticeable decline in the number of short blog posts, with most bloggers opting for longer posts with more focus on quality content- Quality over quantity. 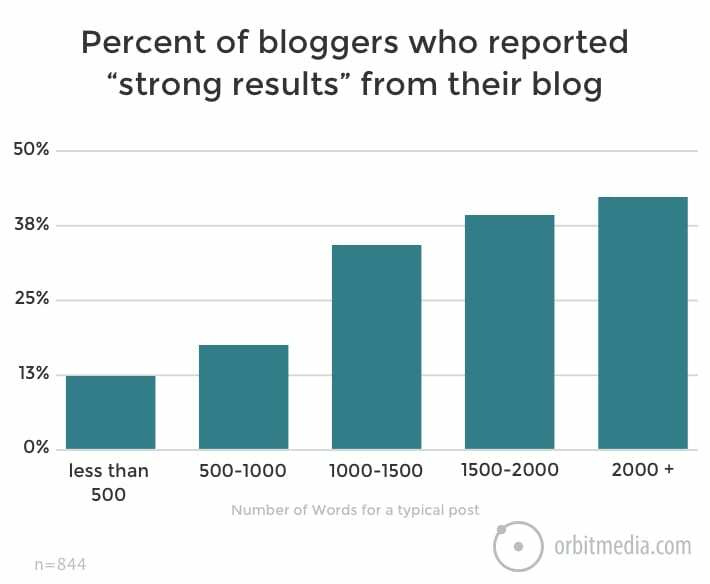 Not surprisingly, most bloggers claimed to have found more results from blog posts that contained over 1500 words. Bloggers are also getting more creative and are spending more time and effort on their posts. They are incorporating more visuals, such as images and videos into their posts. While most typical blog posts contained images over other forms of visuals, bloggers who used video content reported much stronger results instead. The inclusion of lists into blog posts is also a trend on the rise, while some bloggers also claimed to have included calls to action, stories, links, and statistics, among other things. 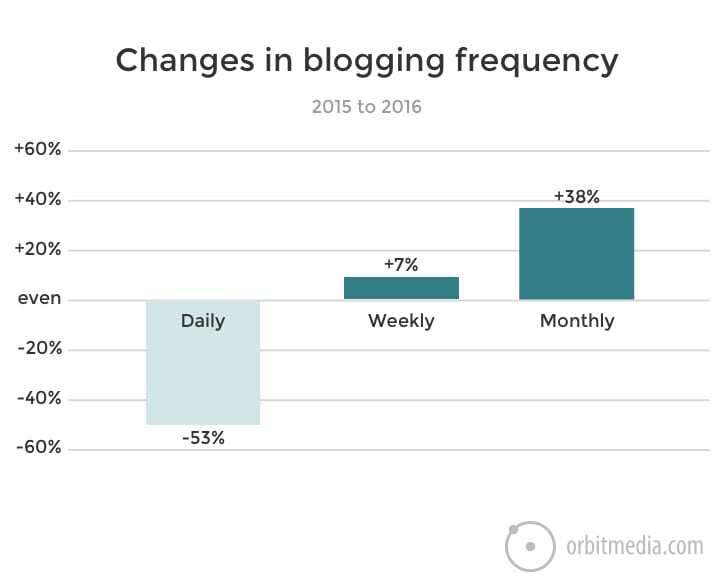 While the quality of blogging content and the length of the posts is on the rise, the frequency of blogs being published is on a decline, with most bloggers opting to blog weekly, bi-weekly, monthly, or irregularly. The study shows that the number of bloggers opting to post daily is down by more than 50%. The trends are more in favour of weekly and monthly-based blog posts, with a 38% rise in the number of bloggers who publish on a monthly basis. 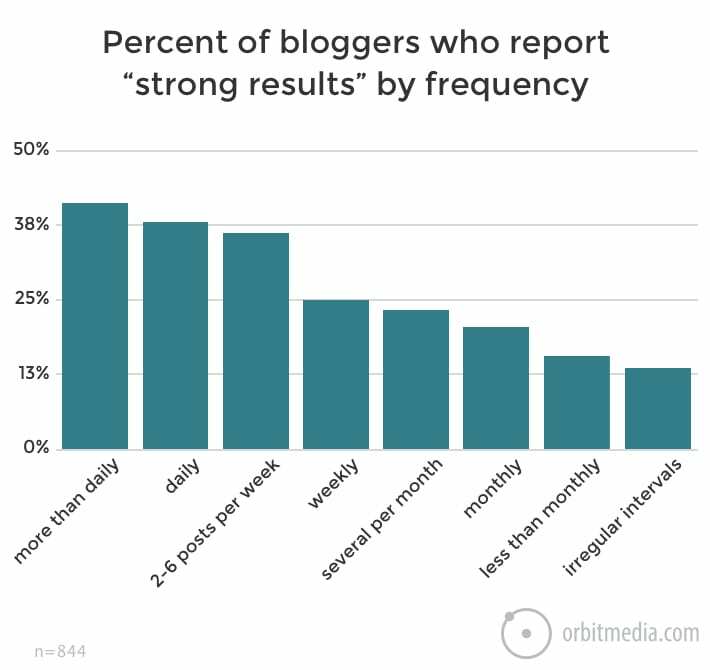 Rather interestingly, despite the downward pattern in the frequency of blog posts, bloggers who published more frequently reported “strong results” in comparison to bloggers who opted to publish less frequently. When asked about how bloggers were driving online traffic towards their content, the findings were not too surprising. The study strongly indicates that nearly all bloggers are more focused on marketing their content than ever before. The trends also show that there is an increase in the use of each of the above mentioned promotional tactics. But when looking into which promotion channel derived the better results, the findings were unexpected. Most bloggers who used paid services of promotion reported higher results when compared to bloggers who used the easier social media and SEO promotion tactics. Analytics is now playing a much bigger role in content creation and blogging. It was found that the number of bloggers who actively check up on their analytics has been increasing over the past three years. There is, however, still a group of bloggers who are yet to exploit the advantages of analytics. 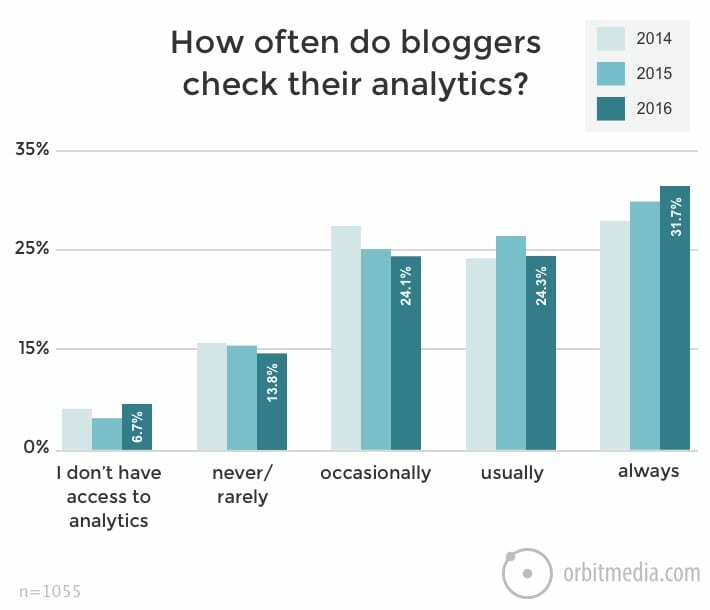 Unsurprisingly, the bloggers who claimed to check on their analytics regularly reported better results. Not only has personal blogging managed to create a lot of traction for itself over the past three years, but so has the business of blogging and digital content creation as a whole. There is a lot of benefits to be derived from adding blogs to businesses and websites for example, and organisations are starting to see the immense potential and ability to generate value from blogs. Content has moved to the fore of reaching out to consumers and audiences- the more informative and engaging your content, the better your chances of drawing in more web traffic. Businesses stand to gain a lot from the digital content industry as well since consumers are now more tech-savvy, more quality and information oriented, and are looking to building relationships with businesses rather than merely be their end-consumers. The findings from the 2016 State of Inbound Report indicate that marketers are in fact engaged in creating content that is irrelevant or out of context. About 30% of consumers said they would like to see more blog posts in the future, while about 60% of marketers decided on prioritising blog posts for the year 2016. A study conducted by Hubspot also clearly indicates that businesses who exploited the advantages of having a blog to their business derived much more value and positive returns in comparison to businesses that did not. The study also suggested that blogs are considered to be the 5th most trusted source of accurate information online. There is no doubt that the time is right for businesses and individuals alike, to be reaping benefits from the promising online content industry. There couldn’t have been a better time for a career as a blogger than right now. How Are Marketers/Bloggers Driving Traffic To Their Posts?